Meek Mill is released from State Correctional Institution Chester April 24, 2018. Rapper Meek Mill, who had become a cause célèbre during a controversial five-month stint behind bars, was released from prison Tuesday, ending a term of imprisonment that had been marked by celebrity outcry, conflict with a judge, and questions about the validity of the entertainer's decade-old arrest. Mill departed a state prison in Chester around 6:30 p.m., quickly getting into a helicopter and heading to the 76ers playoff game against the Miami Heat with team co-owner Michael Rubin. After meeting with players in the locker room, the Philadelphia-born rapper — whose backers included Sixers and Eagles players and politicians such as Mayor Kenney and Gov. Wolf — rang the bell for the home team before tip-off, electrifying the crowd. Meek Mill after his release from a state prison in Chester on Tuesday, April 24, 2018. His freedom was secured thanks to an order issued Tuesday afternoon by the Pennsylvania Supreme Court, which agreed to grant Mill "extraordinary relief" because of questions the Philadelphia District Attorney's Office recently expressed about the credibility of Mill's arresting officer. Prosecutors said last week that they believed Mill was entitled to a new trial and would not oppose his release on bail. They have yet to say whether they will continue to pursue those charges. The rapper tweeted about his release shortly after the order was made public, calling his time behind bars "a nightmare" but thanking his family, supporters, and even the prosecutors' office for its "commitment to justice." As news of his impending release spread across social media, hundreds of Mill supporters gathered outside the state prison in Chester where he had been incarcerated, blocking traffic in an impromptu rally while trying to catch a glimpse of the entertainer upon his release. 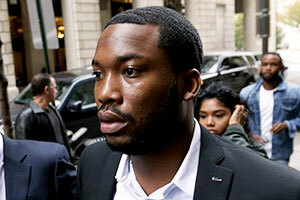 Mill's lawyer, Joe Tacopina, said in a statement that he was "thrilled," and that "Meek is excited to be reunited with his family, and we, along with Meek, intend to continue to shine the light on a justice system in need of reform to prevent any other citizen from being put through what Meek has endured." Meek Mill has been imprisoned three times and found to have violated his parole twice since his arrest in Southwest Philadelphia in 2007 on drug and weapons charges. Click here for a chronology of Mill’s controversial case. Mill has been imprisoned since November, when Common Pleas Court Judge Genece E. Brinkley sentenced him to two to four years for probation violations related to a decade-old conviction on gun and drug charges. Her decision sparked immediate outrage among athletes and celebrities, and fans rallied outside the Criminal Justice Center to describe Mill's case as an example of the flaws in the criminal justice system. Political support soon followed, with Kenney among those who traveled to the prison in Chester to visit Mill, 30, whose legal name is Robert Rihmeek Williams. Wolf sat with Mill and Rubin at Tuesday's game, an invitation Rubin had extended weeks before Mill's release was secured, said Wolf's campaign manager, but one the governor was nonetheless happy to accept even after Tuesday's developments. Still, perhaps nothing was more instrumental in facilitating Mill's release than what happened after District Attorney Larry Krasner took office in January. Krasner, who campaigned on a pledge to reduce the number of people behind bars, disclosed in February that Mill's arresting officer, Reginald V. Graham, was on a list of police officers with credibility questions, something Mill's attorneys said they had not previously been told. His attorneys then filed paperwork accusing Graham of lying to secure Mill's arrest, and Krasner's office responded by saying it had questions about whether Mill's original conviction should stand. Last week, prosecutors stated in court that Mill was entitled to a new trial and that they did not oppose his release on bail. Before Tuesday, none of those actions had led to Mill's release because his case lay in the hands of Brinkley. And Mill's legal team for months had accused her of ethical improprieties, which she later described as evidence-free. Late last month, the judge defended her handling of the case, saying: "This court committed no error." The Supreme Court's order Tuesday said that because the District Attorney's Office had agreed to a new trial and did not oppose Mill's release on bail, the rapper should immediately be released. The order also said that Brinkley — or another Philadelphia judge, if she chooses to recuse herself — should come to a final resolution over the matters still pending in his case within 60 days. It was not immediately clear whether prosecutors would seek to try Mill again on the original drug and gun charges. Ben Waxman, a spokesman for Krasner's office, declined to offer further specifics about Mill's case, but noted that prosecutors last week dismissed three other cases built by Graham due to concerns about the officer's credibility. Such questions were a bit of an afterthought Tuesday. In a video posted to Instagram, Mill recorded himself running onto the helicopter that was departing a prison and headed to a frenzied playoff game. It was captioned simply: "Blessings." Staff writers Angela Couloumbis and Sarah Todd contributed to this article.